Arriving at an understanding of why things happen (cause and effect) is crucial IMO. The interconnectivity between the two previously mentioned principles is evident. 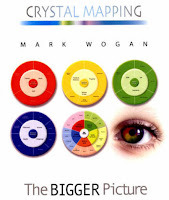 Crystal Mapping is an excellent hard copy book published by the author Mark Wogan during 2006. 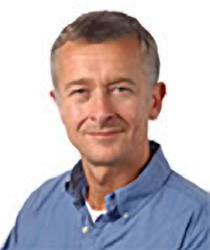 I am privileged to include Mark Wogan as a part of my professional network of colleagues and associates. Some are developers, some consultants, some thought leaders and some are venture capitalists. Mark Wogan falls into all of these categories. 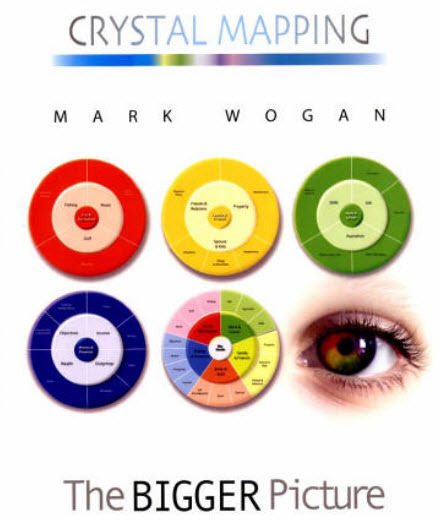 I am aware that when Mark developed Crystal Mapping he was first to market offering it as a radiant pie type of dashboard for the information-knowledge manager. It's an excellent approach to creating managing and expressing data, information and knowledge. and is one of a few interesting radiant dashboard tools currently available. It is quite amazing the process of discovery and illumination that Mark went through, finally arriving at the Crystal Mapping format. There's no doubt this radiant dashboard format will become more mainstream. I have read through Marks publication several times and, every time I revisit the Crystal Mapping pages, I glean more and more from Marks journey of illumination and the release of Crystal Mapping as a desktop and cloud SaaS product. As of the date of this blog, I am aware of very interesting developments regarding Crystal Mapping, and I am sure Mark and his associates shall make announcements regarding the future of this intriguing and useful tool. As a precursor to future announcements; Mark has graciously agreed to posting excerpts of his 2006 publication for your reading pleasure. Chapter 2 is posted in full: Enjoy! Have you ever wanted to be able to ‘see’ your thinking to make it easier for you to clarify what you mean and what you want to say? And once you’ve done that, to be able to communicate the idea so everyone else can see what you mean? In other words that they just simply ‘get it’? Similarly, have you ever felt that sometimes people don’t get the point of what you’re trying to communicate because they get bogged down on a particular detail that may well be important, but shouldn’t get in the way of understanding the big idea or the bigger picture? If you’ve heard the saying “when you’re up to your neck in alligators it’s hard to remember that the main objective was to drain the swamp”, you’ll know what I mean. Crystal Mapping will help you to clarify and organise your thoughts and ideas and to present them in a way that is visually appealing and clearly understandable to others. It can be used in any environment and by any group, organisation or individual to improve the way ideas and information are communicated to others. Crystal Mapping uses a framework of radiating concentric rings to present key thoughts or elements that you want to communicate. 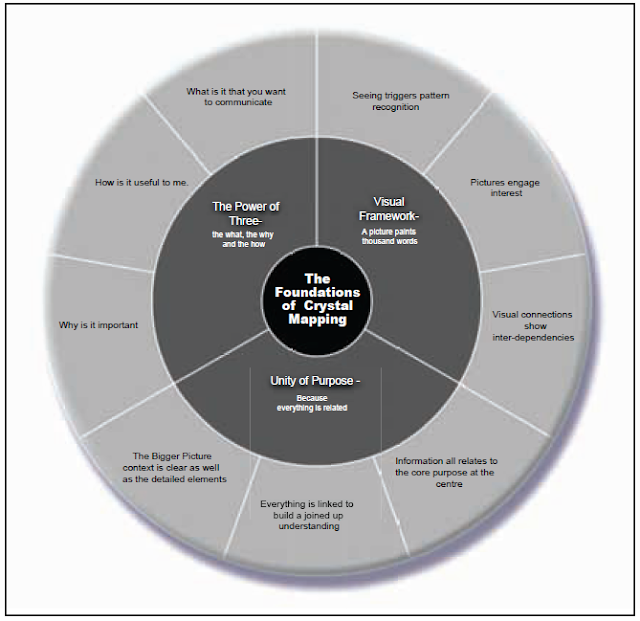 In doing this it shows the stepped and segmented logic of your thinking and how different strands of thought are connected and cascade from the main purpose at the core of the map – see figure 1 below. 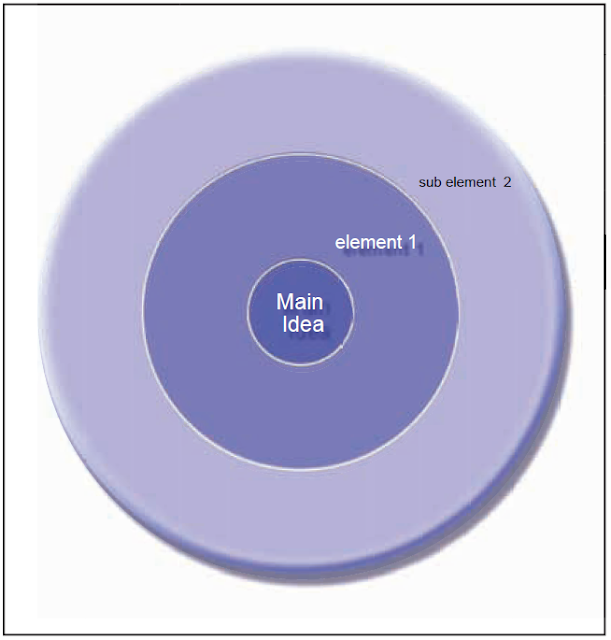 While some visual thinking techniques use line linkage to connect thoughts and ideas as a basis to aid understanding such as mind mapping©, Crystal Mapping uses circles. 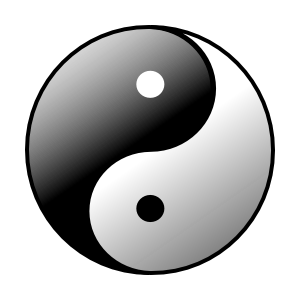 Line connection can show relationships but they cannot represent unity as well as a circle. As all thoughts comprise a number of sub-thoughts, themes and elements which all chime together to make up a whole idea, a circle shows not only how they are connected but also how they are all unified as part of an overarching purpose or bigger picture. made up of just one thought or element. Therefore, having a unifying visual framework that shows how all thoughts and elements comprise a bigger picture has instant impact and utility as a method of thinking and communication. Crystal Mapping formalises the key attributes and benefits of using circles to think and communicate. At the basic level Crystal Mapping is an alternative method for presenting any type of information. From simple ideas to complex arguments, all information benefits from being able to show the audience a visual context for the point(s) being made.This enables them to follow the thought process, form a complete and contextual view and make a ‘rounded’ judgment. At its highest level, the medium itself helps to enhance the message and aid understanding. Delivering information or ideas in a physically rounded fashion unconsciously helps people to form a more inclusive view.The medium might not be the message but it is an integral part of it. It helps your audience get to the heart of the matter – so they can ‘see what you mean’. Figure 2 below shows a basic Crystal Map. At the core of the map it states its main idea or purpose as being to communicate the foundations of Crystal Mapping. It then shows each of the three foundations of Crystal Mapping as key elements in the first level around the core objective i.e. visual framework, unity of purpose, and the power of three.The next level of information summarises the most important sub-elements of each of these three main elements and represents them in a further concentric ring which is segmented into key sub elements under each main element. In many cases this will be all you need.You’ve expressed the purpose or objective which in this case is to inform people of the main principles that underpin Crystal Mapping, and you’ve shown how each strand of thought is related and fits together in a logical and clearly understandable way. 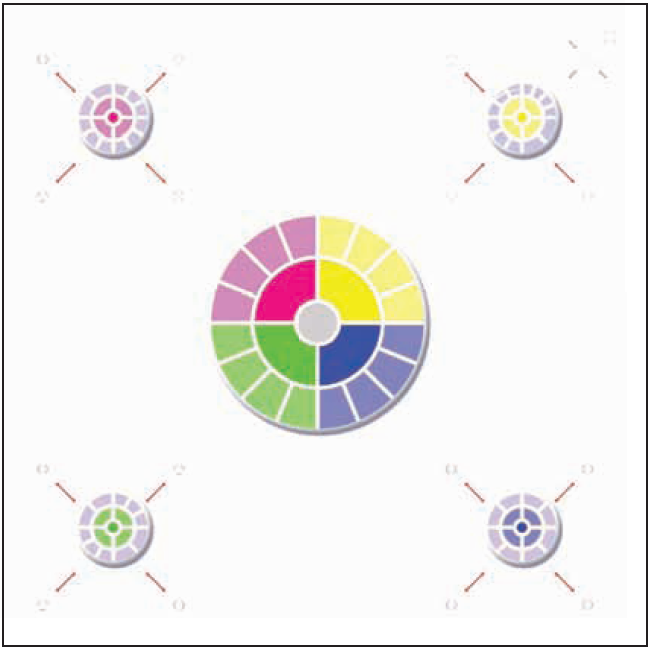 In essence, by using the universal symbol of unity and the innate qualities of circles to express whole ideas simply and elegantly and by adopting a cascading process of concentric rings to represent ‘finer’ detail, Crystal Mapping makes it easy to expand ideas but still keep the main objective clear. The above figure shows a map with just three levels and it is obvious that not all ideas or types of information will have just three levels, although it is remarkable just how many ideas can be expressed by just showing three levels of detail. However, if you wanted to create an organisational map of a typical hierarchical group you would probably need a map more than three levels deep. 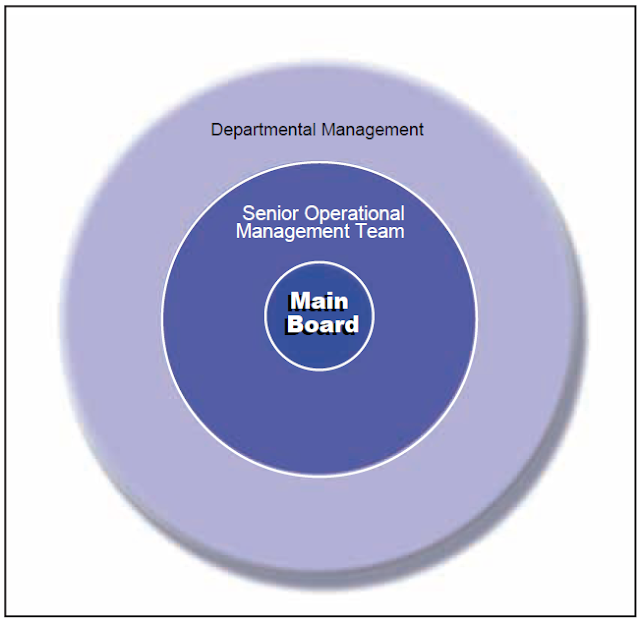 Figure 3a represents the first three levels of the organisation; the main board at the core of the map surrounded by level 2, the senior operational management team and level 3, the departmental management team. 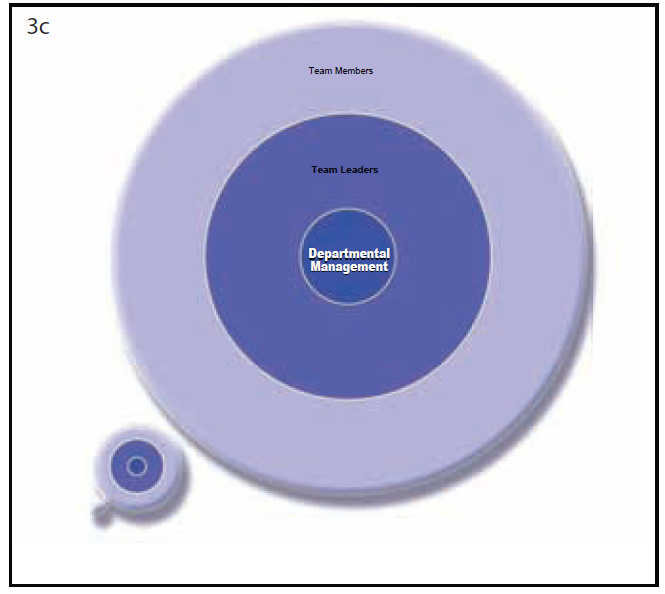 Figure 3b cascades the organisation one level further but instead of adding another concentric ring to figure 3a it takes level 2, the senior operational management team, and puts them at the centre of the next screen display which is then cascaded to two further levels i.e. level 3 the departmental management teams and level 4 the team leaders.The map displayed in figure 3a is shown to the bottom left of the new map to show the audit trail. 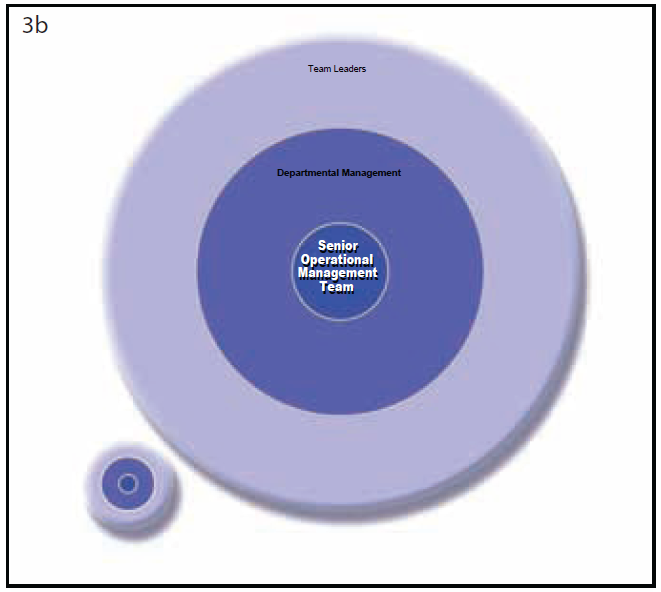 Figure 3c continues this process by taking the level 3 departmental management team, placing this level at the centre of the map and cascading it to two more levels i.e. level 4, team leaders and level 5, team members. The previous maps are again displayed to the bottom left of the main map to show the audit trail. This might sound more complicated than it actually is because in effect all we are doing is moving each level up a step so that we can continue adding further rings and more detail without having to display a map with 5,6,7 or more rings on one screen.There are two reasons for only displaying three levels or rings in any map display. The first point relates to physical screen display i.e. there is a limit to how much information you can display without reducing readability,clarity and ease of visual comprehension. The same occurs in all screen-based information presentation systems and is not specific to Crystal Mapping. In PowerPoint and mind mapping packages for example, it is always recommended that you try to limit how much information is displayed ‘on one page’ to make sure content is not lost in over­crowding.The same goes for all non digital based communication such as traditional pen and paper; more words do not always result in deeper understanding. The second point is that three is a magic number in terms of most people’s ability to absorb, make sense of and recall information – (see later chapter).As such we need to limit the amount of information we express at any one time in a map to the amount of information anyone can easily grasp and digest. At the same time as limiting the amount of radiating rings to three in any one screen view, and I would argue the same should apply to any freehand crystal maps or maps drawn in other desktop programmes, Crystal Mapping nevertheless always maintains a direct line of sight to the core of the map as each new set of three radiating circles is added to the preceding ‘sets’ which are displayed as a visual audit trail from the bottom left of the screen as in figures 3b and 3c above. Taking this process to its extreme we can see that there is no limit to the number of levels a map can comprise. Not only can a map comprise any number of levels, it can also be viewed in a number of ways on screen. For example if you want to show the full structure of a map and present directly from the diagram this creates, you could display your map as shown in Figure 4 below. As well as creating a unified bigger picture structure that can be used to present themes and issues, Crystal Maps can contain further information embedded into the map. 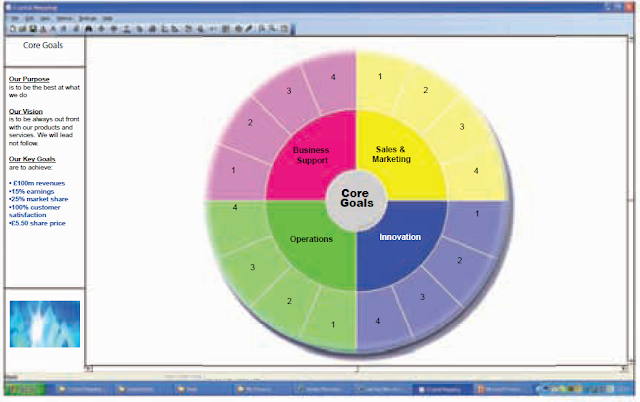 For example as in the Figure 4 map above, the core may be simply called ‘Goals’ but by rolling the cursor over this part of the map within the Crystal Mapping software you can access more detail that is related to this segment. In figure 5 below you can see that‘Goals’ is complemented by further information displayed on the side of the page that adds further detail to the ‘Goals’ core segment of the map. Similarly images, attachments and links can be added to any segment of the map created in the Crystal Mapping programme. Crystal Mapping is all about circles and using them to communicate information in a way that enables people to form a well rounded ‘bigger picture’ view.We’ll explore exactly why circles are so powerful in the next chapter.